Rick’s Heating & Cooling offers installation and replacement services on Armstrong Air gas furnaces, including the 95% AFUE model, for homeowners throughout Morrow and the surrounding Ohio area. If you need a new furnace installed, consider the 95% AFUE gas furnace from Armstrong Air. At Rick’s Heating & Cooling, we’ve been doing business in the Cincinnati area since 1986, providing expert furnace installation services in Warren, Butler, Hamilton, Clermont, and Clinton counties. Our certified and licensed technicians can replace and install a new Armstrong Air furnace, service and repair your existing 95% AFUE model (including emergency service 24/7), and even complete an annual maintenance inspection and tune-up on your system. If you’re looking for reliable and professional furnace installation service of a 95% AFUE furnace, call Rick’s Heating & Cooling today—or keep reading to learn more about the benefits of choosing this gas furnace. During milder weather, our two-stage furnace can reduce its output to more closely match your home’s comfort needs. On most days the furnace will run 75-80% of the time on low output, allowing the furnace to cycle less often and creating a more even and comfortable environment. When outdoor temperatures drop, your furnace will easily meet the demand, by running at a full 100% capacity, keeping your family warm and comfortable. Using continuous fan allows even temperatures throughout the home while continuously filtering the air. The System Sentry™ control system helps assure safe, reliable and efficient operation by constantly monitoring and controlling the furnace. Should trouble occur, the System Sentry™ control system will provide service codes to a contractor to help quickly and accurately diagnose the problem. The time-tested stainless steel heat exchanger with a limited lifetime warranty* will provide years of reliable, trouble-free service. The cabinet is fully insulated, enhancing efficiency and assuring quiet operation during all seasons. A variable speed motor provides quiet, gradual blower start up and shut down. During “Fan On” operation, the variable speed blower reduces output by 50% for quiet, comfortable air movement. Our 95% AFUE is one of the highest efficiency ratings available on a gas furnace, significantly reducing heating costs† compared to the older furnaces it often replaces. What’s more, our variable speed motor can cut your electrical consumption significantly in both normal and continuous fan modes. Together, these gas heating and electrical efficiencies provide one of the most energy-efficient comfort systems available today. With the ability to start gradually and run on continuous fan at a reduced speed, the variable speed fan motor allows air to flow evenly and consistently throughout the home. This ensures greater energy efficiency and helps maintain an even temperature throughout the home. †Actual cost savings may vary depending on personal lifestyle, system settings, equipment maintenance, local climate, actual construction, installation of equipment and duct system, hours of operation and local utility rates. 5-year Limited Warranty on parts. Proper sizing and installation of equipment is critical to achieve optimal performance. Split system air conditioners and heat pumps must be matched with appropriate coil components to meet ENERGY STAR criteria. 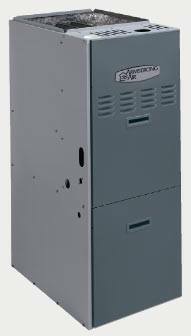 To have a 95% AFUE gas furnace installed in your home in Lebanon, Morrow, Cincinnati or the surrounding Ohio areas, contact Rick’s Heating & Cooling. Our expert team of HVAC technicians has been proving exceptional furnace services to the homeowners of our area since 1986. We can help you properly size and fit not only your new furnace, but the ductwork as well—call us today at 513-899-6005 for a free estimate on qualified installations!